Gilpin Hotel & Lake House Country House HotelAt the heart of Gilpin is a very passionate family and team, dedicated to creating lasting memories for their guests, who return time and again for celebrations and escapes. With five stars, one Michelin Star and three AA Rosettes, warmth and friendliness are balanced with extraordinary service, exquisite décor and stunning culinary experiences at these two luxury country houses spanning two estates in the beautiful Lake District. Dine in either the Michelin starred main restaurant, ‘HRiSHi’, where Hrishikesh Desai combines great Lake District produce and classic methods to deliver unbelievable textures and flavours with just a twist of Asia, or in ‘Gilpin Spice’ a informal restaurant transcending international boundaries, with an open kitchen focussing on dishes from the spice trail spanning the Indian sub-continent, Malaysia, Thailand, Indonesia, the Philippines, Japan and China. At Gilpin Hotel all of the bedrooms have lovely Lakeland views, most leading directly onto the gardens - 6 Garden Suites with their own cedarwood hot tubs, and 5 fabulous detached Spa Lodges with private ensuite spas (rainmaker showers and steam rooms inside, hydrotherapy hot tubs and saunas outside) for a very special, private experience. Just a mile away at Gilpin Lake House, just 6 suites enjoy exclusive access to 100 acres of grounds, including a stunningly beautiful private lake, boat house, pool, hot-tubs and spa. Guests have free use of local leisure club, 4.9 miles away, with a swimming pool, gym, sauna. Treatments are available at the Jetty spa Lake House. Children welcome from age 7. Save £50 in 'HRiSHi' Michelin Restaurant - Book our Dinner, Bed and Breakfast rate on our website or over the phone and save £50.00 per room on our menu at our Michelin 1* restaurant HRiSHi. Only applies to overnight stays and reservations made directly. 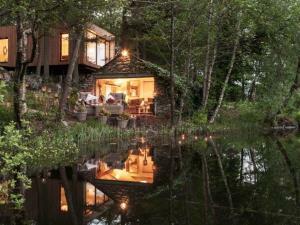 Gilpin Hotel & Lake House sometimes limits bookings to 3 or more days. 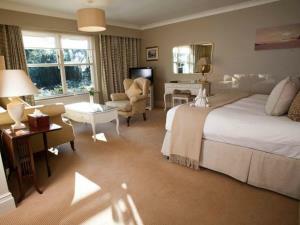 The Classic bedrooms are traditional in size with comfortable seating in the rooms, and overlook the moors and gardens. The luxurious en suite bathrooms have combined baths and showers. All rooms are non-smoking, and are well stocked with Molton Brown products, dressing gowns, minibars and tea trays with homemade biscuits. All rooms are individually designed and furnished to a very high standard, and can be viewed in a virtual tour. Rate plan excludes breakfast and dinner. The Junior Suites are very large with distinct lounge areas, some are split level, and sumptuous bathrooms with separate walk-in showers and spa baths. Some have 4-poster beds, some have king-size or twin beds, with French windows and private patios leading onto the garden or large bay windows overlooking the moors and gardens. All rooms are non-smoking, and are well stocked with Molton Brown products, dressing gowns, minibars and tea trays with homemade biscuits. 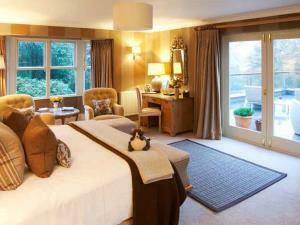 All rooms are individually designed and furnished to a very high standard, and can be viewed in a virtual tour. Junior Suites sometimes limits bookings to 3 or more days. 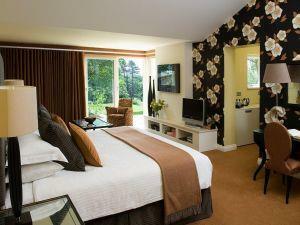 Open plan rooms with double or twin beds, seating areas, en-suite bathrooms, luxurious toiletries and beautiful views. All are equipped with flat screen TVs and IPOD docking stations, and tea and coffee trays with home-made biscuits. The Lake House Spa and 100 acres of grounds are for the exclusive use of Lake House guests, including a myriad of treatments, salt snug and heated indoor swimming pool with views towards the cedar wood hot tub on the lake edge. The Lake House is just under a mile from the main hotel. Lake House sometimes limits bookings to 3 or more days. 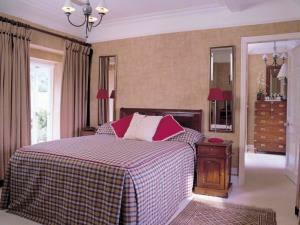 The Master bedrooms are large with comfortable lounge areas overlooking the moors and gardens. The en suite bathrooms are luxurious, most with a separate bath and shower. All rooms are non-smoking, and are well stocked with Molton Brown products, dressing gowns, minibars and tea trays with homemade biscuits. All rooms are individually designed and furnished to a very high standard, and can be viewed in a virtual tour. Master Room sometimes limits bookings to 3 or more days. From M6 jct 36 take A591 past Kendal. At roundabout take 1st exit signposted Crook B5284. Four miles along the B5284, Gilpin Hotel is located on the right-hand side. We have enjoyed our stay at Gilpin Hotel, the beautiful place, the atmosphere, the kindness of the staff, .. everything. We felt the hotel friendly and warm, thanks for being so welcoming. The food was also very nice. It´s worth to recommend the place to colleagues and friends.